Mogoso (mogoso.com) is a search site that simultaneously searches Yelp for stores and restaurants and also does an Amazon shopping search. The results link to reviews Amazon or Yelp reviews. It’s a strange combination, while Amazon will sell you almost anything and you can review anything on Yelp, those sites specialize in books and restaurants respectively. I suppose I might want to simultaneously search for sushi bars and sushi cookbooks it doesn’t seem very likely. Grumbling aside, I do find Mogoso’s search interface and results pages cleaner and and easier to navigate than either Amazon’s or Yelp’s. 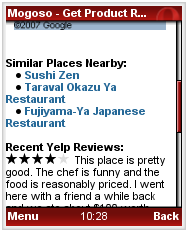 For one thing, searching for restaurants by zip code actually works on Mogoso by returning results by distance, Yelp (review) first returns results sorted by rating from throughout the metropolitan area, you have to click a link and wait to find the nearest ones. With Amazon, Mogoso includes excepts of reviews right on the initial results page rather making you click through to read the review. This entry was posted in City Guides, Site Reviews by Dennis Bournique. Bookmark the permalink.